Davam Urgent Care located near The Woodlands, TX is a walk-in clinic with the ability to treat you and your family. At our walk-in clinic, patients can receive care for non-life threatening illnesses and injuries from a board certified medical provider. An appointment is never required and we are open daily 8am-9pm. Walk-ins are always welcome allowing for convenient visit times that fit around your schedule. Diagnostic Services- Davam Urgent Care is equipped with a full service on-site lab and digital x-ray machine. Services that can be performed include x-rays, drug screens, strep throat testing, flu testing, complete metabolic panels (CMP), complete blood count (CBC), cardiac enzyme testing, urine testing, and more. We also offer flu shots, tetanus shots, and tuberculosis skin testing (TB). Occupational Medicine Services- The board certified medical providers at Davam can see workers compensation patients for injuries occurring on the job. We also provide employers with pre-employment testing including physicals, drug screens, and alcohol screens. Our clinic is contracted with most major workers compensation insurance carriers including The Hartford, Travelers, Sedgwick, Creative Risk Funding, and more under the Texas Star Network. 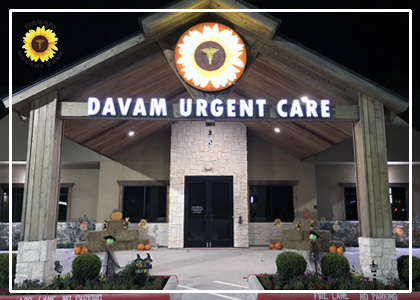 For more information regarding Davam Urgent Care located near The Woodlands, TX please call (281) 583-1980 or visit us at 6022 FM 1488 Magnolia, TX. Patients can also check-in online to reserve a same day visit time to allow for a shorter wait time at the clinic. If you require urgent care, simply visit our walk-in clinic located near The Woodlands. Currently, Davam Urgent Care serves The Woodlands zip codes of 77380, 77381, 77382, 77384, 77385 and the surrounding communities.